Are you tired of your same old meal plans from last year? Are you ready to introduce new healthier options in 2017? Do you and your family want to incorporate more vegetables into your meals but are not quite sure where to begin? Now is the time to make some New Year's "Vegolutions" for your busy lifestyle! MorningStar Farms® products are a great way to incorporate vegetables into your weekly meal planning. These items are not just for vegetarians, but are great for everybody! With MorningStar Farms® products, it is easy to substitute meat for veggies and use them for breakfast, lunch & dinner! Don't miss this great Ibotta offer! 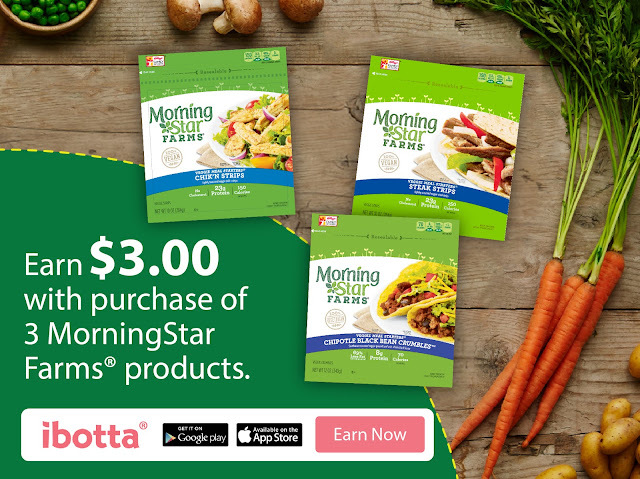 When you buy any 3 MorningStar Farms® products at Walmart, you will earn $3.00! *Offer available through 2/15/17 or while supplies last.